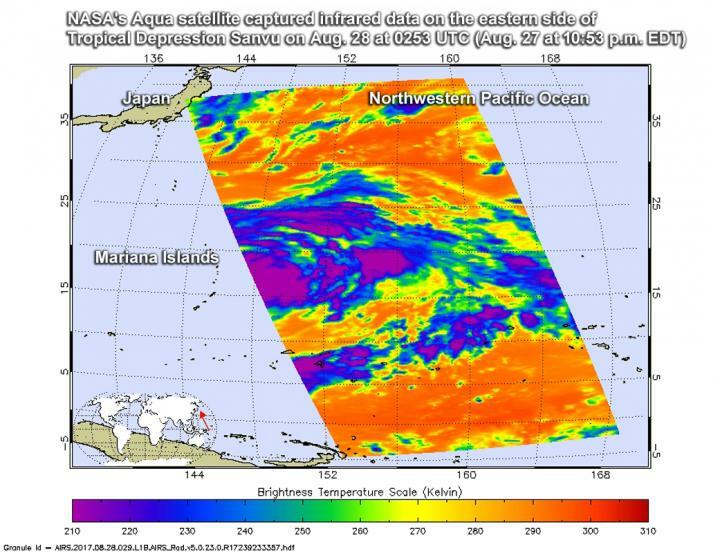 NASA's Aqua satellite used infrared light to gather cloud top temperature data from the newest tropical cyclone in the Northwestern Pacific Ocean. Tropical Depression Sanvu formed just north of the Northern Marianas islands. The Atmospheric Infrared or AIRS instrument aboard NASA's Aqua satellite captured infrared data on the eastern side of Tropical Cyclone Sanvu on Aug. 28 at 0253 UTC (Aug. 27 at 10:53 p.m. EDT). Infrared data provides temperature information to scientists. Cloud top temperatures are an important factor when it comes to determining the strength of storms. The higher the cloud tops, the colder and the stronger the storms. The image showed that the coldest cloud tops were colder than minus 63 degrees Fahrenheit (minus 53 degrees Celsius). Those storms were around the center of circulation and in a band of thunderstorms located east of the center. NASA research has shown that storms with cloud tops that cold, reached high into the troposphere and had the ability to generate heavy rain. At 11 a.m. EDT (1500 UTC) on Aug. 28 the center of Sanvu was located near 20.4 degrees north latitude and 146.4 degrees east longitude. That puts the center about 85 nautical miles north-northeast of Agrihan. Maximum sustained winds were near 30 knots (34.5 mph/55.5 kph). Sanvu was moving to the north-northeast at 2 knots (2.7 mph/3.7 kph). The Joint Typhoon Warning Center expects the depression to move north and intensify to typhoon status by Aug. 30, before weakening again.